Conveniently located in the dynamic central business district Homewood Suites by Hilton Houston Downtown is within walking distance of Houston*s top Fortune 500 corporations such as Chevron Exxon Shell Chase KBR Center Point Energy Hess Wells Fargo Deloitte Ernst - Young PricewaterhouseCoopers KPMG and Waste Management and all downtown attractions including the George R. Brown Convention Center Houston Astros*s Minute Maid Park Houston Rocket*s Toyota Center Houston Dynamo BBVA Compass Stadium and Discovery Green Park. 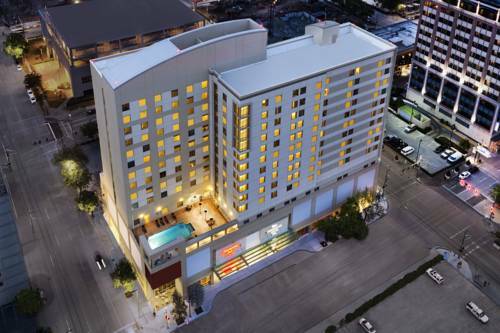 while being just minutes away from NRG Stadium Texas Medical Center Rice University University of Houston and the Houston Museum District. Visit Houston during our annual events of the Chevron Marathon Houston Livestock Show - Rodeo Offshore Technology Conference Art Car Parade or for just a fun weekend get-away. Get your day off to a great start at this extended-stay downtown Houston hotel with a complimentary hot full breakfast buffet. Stop by our dining room Monday through Thursday evenings to enjoy our complimentary evening social*. Bright and modern all of our suites are equipped with homelike amenities including complimentary WiFi a work desk and a full kitchen perfect for an extended stay. Upgrade to a higher floor suite for more space and wonderful corner views of downtown and Minute Maid Park. Enjoy our onsite lobby bar for refreshing beverages and small plates and stock up on drinks snacks and sundries in the 24-hour Suite Shop. Energize with state-of-the-art equipment in our complimentary fitness center with views of our sparkling 4th floor roofscape pool that overlooks Discovery Green Park. Make sure you don*t run out of clean clothes with our handy onsite laundry facilities and take advantage of printing and photocopying services in our complimentary business center. *State and local laws apply. Reservations must be cancelled 24 hours prior to arrival host time to avoid penalty. Policy is subject to change.